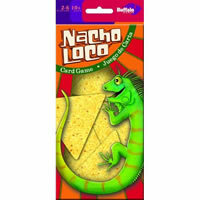 Start playing this popular kids card game called Nacho Loco today! These Nacho Loco cards are not like other cards. Cards are a three sided triangular shape to add to the strategy of trying to get rid of all your cards before you opponents can. Nacho Loco has some luck involved but will make you think about how to outwit your opponents. This card game is great for traveling and up to six players can play. Learn more about Nacho Loco card game. In the game of Nacho Loco you want to be the player that gets twenty points first. To do that you need to get rid of every card you're holding. When that happens you'll collect points for each of the remaining cards your opponents are holding. Nacho Loco in total has 94 cards (31 action cards & 62 color cards, 1 The Closer card) and the Nacho Loco card game rules and instructions. Please keep in mind that the official Nacho Loco party rules and instructions could be different depending on the game version you have. The rules below are some of the exact directions on how to play Nacho Loco. Share with us your comments, funny stories, tips, advice, strategies, creative ways to play, questions about how to play, problems with the rules or anything you want about Nacho Loco. All submissions will be reviewed within 24 hours. Click here to add your Nacho Loco comments.